Tour de historische stad in een door en door moderne auto. 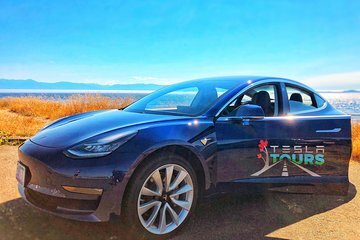 Jij en je vrienden zullen genieten van de luxe rit in een Tesla terwijl je privégids je chauffeur naar de bestemmingen in en rond Victoria die je het meest te zien krijgt. Reisroutes worden aangepast aan uw tijd en interesses om er een gepersonaliseerde tour van te maken waar u dol op bent. Kevin was on time and so knowledgeable about Victoria. We had a wonderful tour with geological details, history and trivia of the area. We will definitely call him again when we return for his other tours.He is outstanding in his demeanor and presentations. Kevin far exceeded any expectations. He was informative and gave us the best tour we have ever had in places all around the world. Kevin knows Victoria in ways that few could possibly know. He understands the history including the pre-history and geological development of the area up to the modern times. What we particularly liked was his sensitivity to our expressed interests and wishes. This tour was like having a family member show you around who knows pretty much all there is to know about Victoria and surroundings. Tesla with heads up display and sunroof is truly a magic carpet.